Today we want to introduce Codeforces API. With it you now can access some of Codeforces data in machine-readable JSON format. API has a detailed manual, which is supported to contain only actual information. Every method has an example URL. You can use it to see the example response and to experiment with different parameters. By default, any API request will be anonymous and will have access only to public data. To make a request on behalf of some user, user must create an API-key at /settings/api and read the bottom part of manual at /api/help. For now, all methods are read-only. Write-methods like "submit a solution" are comming soon. We are open for suggestions and requests for new API-methods. Especially from respected members of contest programming community. What can I do with these? I can't understand enough. Maybe it will be good to include the 3-byte color code (or css class) of the rating in User object for the people who will make their own Codeforces widget. I agree. In my script, I added the color back in by hand. The link "settings/api" should be "/settings/api". Great news! I'd like to be able to get list of test cases for problems via the API. if that's possible, then i think we will be able to see big testcases in full (instead of only first ~100 characters). Oh, I actually meant the sample test cases from problem statement! The best update ever! Thanks! if they provide api for viewing problems(past or current contest) and submitting problem solution, then someone(me) can build topcoder arena type software. But its nice work. yep, webpage format is good, but I'd like to have something that allows me to run my program with sample test cases without using the typical CTRL+C and CTRL+V, and send my file without looking for it and something like that. It's hardly different from 2-3 clicks. But I usually copy all samples into the command line using <<< "", because I can switch between testing them and compiling at the speed of repeatedly pressing up-arrow (read: extremely fast). If I click too fast in TC arena, it says that the server's busy; if I do it in the command line, the commands (for example, compile run sample 1 run sample 2, which are (up up up enter)x3) are queued, so it actually has more benefits if one prefers keyboard to mouse. I respect it, it's a matter of opinion, but I was thinking on a tool that copy I/O and let you know if they match or not, like greed, without as you said waiting the response of TC arena, and also let you customize more things. Well one question, how would you like to use the new API? IN THIS CONTEST WILL BE RATED OR NOT? Is jsonp callback supported by the api? I'm trying to do ajax through jquery. If my request datatype is set to "json", then due to cross-origin policy it's not possible to send the request. If I set it to "jsonp", the server returns "json", thus the client library can't parse the returned data since it's expecting a "jsonp". I can see on the Network tab of chrome that json-data is already returned by the server but ajax library of jquery can't parse it due to datatype mismatch. Can anyone provide a solution/workaround to this problem? I don't want to use an intermediate server side to get the data at client side, though that way I can easily get it but in my opinion that is just a bypass solution. It will be implemented. Thanks. It has been 10 months, and I still see this same issue. Maybe just use the simple solution and add: Access-Control-Allow-Origin to your API response? I don't see any security concern here, since what we can do with CF API is quite limited to getting info that is already available. About 10 months ago JSONP has been supported. It was reflected in documentation. Ah, sorry, I have missed that part. making request gives incorrect signature. is there any problem in sha function or something else? It looks like you have some errors in building the string to hash. I think a method to return all problems here would be great (with this page's links and information, not the contest's information). Can you add this please? I need it to convert all my code to use the API. I know I can get the list of contests, and for each contest get its problems, but this will not work for me. I'm afraid someone may create bots to hack others. This could do damage to the fairness. Methods like "submit a solution" are dangerous. So spammers can write programs to download and submit other users answers for their own account. And go up in problemset standings. i don't think anyone would want to solve problems in practice just to go up in Problemset Standings. i would rather solve problems in contest (and get the bonus of increasing my Rating), when solutions will not be publicly available. if there are users really desperate to solve problems in practice, they can just copy-paste solutions of other users and submit them from their own accounts by the usual method. i agree they can do it faster using the API, but i don't think this is a major concern right now. Thank you for creating this. 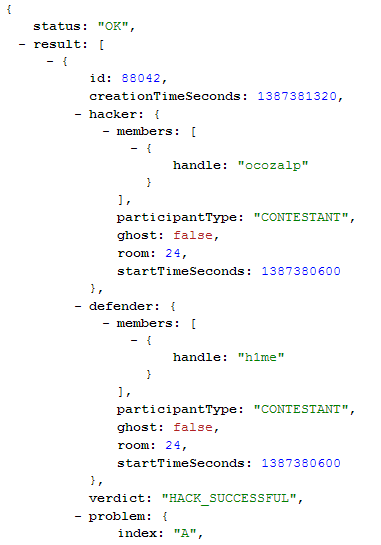 It was very good timing for me; I was just asked to make a script to track Codeforces activity for US IOI contestants, and the API was very helpful! I'm writing python scripts to pull data and planning to do some analysis. But I find it's hard to deal with the problems which appear in both div.1 and div.2 contests. I can't find a way to get the contest id of corresponding div.1 AND div.2 contest. I can only get one of them (div.1 OR div.2) from the problemset.problem api. Is there someone who can tells me which api should I use? I also found that the "Solved" part of the website is a little confusing. For these problems which are in both div.1 and div.2 contest, when I add them to my favourite problems, and go to my fav. problem page, the "Solved" value is "the number of users who solved this problem in div.1" or that of div.2. In "ProblemSet" page, "Solved" is problem.solved; in "Contest"->"Problem" page, "Solved" is contest.problem.solved; in "Favourites" page, "Solved" is contest1.problem.solved or contest2.problem.solved. Wouldn't it be one of the most useful ones? Is there any way to get all DIV-1 contests ID ? Can you please add the number of people solved a particular problem and the date when the problem published in the problemset.problem api. I want to make a recommendation system. Thank you. This api is great. user.info is returning 414 : Request URI too Long error, even when I have less than 5000 handles in my query. I think you need to remove that restriction from the server when the docs says 10000 handles. Could you please expose a method for us to get the original source codes for our submissions? Also, in request: http://codeforces.com/api/user.status?handle=mR.ilchi the handle "mR.ilchi" contains "." which is not Latin letters, digits, underscore nor dash characters. But the response status is "OK". "Write-methods like "submit a solution" are comming soon" when will it show up ? So, how are the write-methods comming up? I would really love to use them. Is there any way to get the list of upcoming contest. By using contest.list method it returns a total list of all contest in codeforces, which makes my website slower. Is there any problemId for problem? In problem Object problemId is absent. I need a way to uniquely identify problem. Combination of problem index and contestId might not work as sometimes same problem appear both in div1 and div2. Any kind of suggestion will be appreciated. How can I get correct unique number of accepted solutions for a given problem? https://codeforces.com/api/problemset.problems gives a lot more count than the correct count. Maybe it is giving total number of accepted solution? Try opening without login on codeforces. This is a known issue. Server time: Apr/20/2019 22:05:27 (f2).